Tolko Armstrong is one year into a $35-million revamp to improve lumber recovery and increase lumber values. Tolko Armstrong in the B.C. 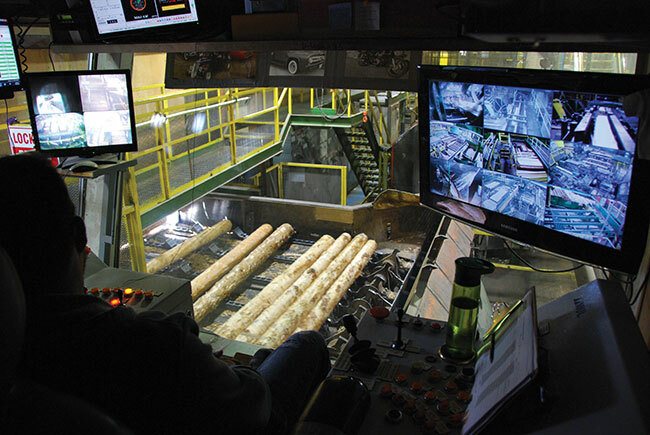 Interior is a year into a multi-year multi-million dollar capital investment project to increase lumber values and improve recovery while reducing costs, to ensure the operation remains competitive for years to come. The project will see some of the latest sawmill technology installed, including USNR’s BioVision grading module and SiCam’s closed-loop system to automatically adjust cutting tools. The investment comes on the heels of a similar revamp at the planer mill in 2015, which now boasts impressive speeds and industry-leading robotics. The mill site employs just over 450 people and houses a sawmill, planer mill, plywood plant, and co-generation unit. When you walk into the mill, you notice how busy it is. The nine-foot stud mill runs two lines, with two infeed decks, accepting everything from four- to 20-inch logs of hemlock, balsam, SPF and Douglas fir. 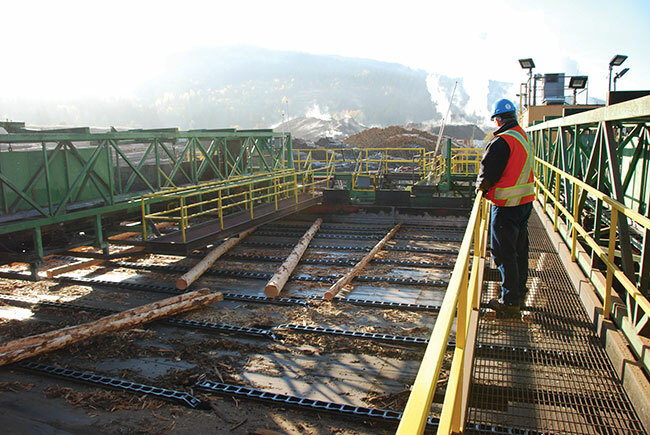 A log loader feeds the long-log infeed deck. Logs are singulated by a large drum unscrambler, then travel via a series of belts through a 22-inch Valon Kone debarker and are swept onto transfer chains carrying them though an in-house built slasher system. A John Deere 844 (or Cat 988) loads short logs onto the second infeed, which travels to a Linder stepfeeder where logs are singulated and sent through a 22-inch Nicholson debarker. Like the long logs they are swept onto transfer chains carrying the logs through the same slasher deck. This past November; the mill took two weeks down to conduct a major upgrade on the OHED. The charger system was replaced with a new, advanced charger system, housing both an advanced scanning system and a log rotation system. Resource Saver Industries (RSI) from Gig Harbour, Wash., supplied the mechanical components. The line is running well with improvements both in rate and recovery. SiCam’s WaneX laser-line scanners measure the cants from the end dogger for size control, as well as scan the opening faces and verify the information from the Comact optimizer. Both sawlines lead to Ukiah edgers. After the edgers, boards are directed to one of two Newnes stackers. Both infeed lines to the stackers are fed by Newnes unscramblers. One line heads to a Newnes sorter prior to the stacker. The other line, called the hot line, goes directly to the stacker. In the coming months, the mill will install a new transverse edger and a two-sided canter line, both supplied by USNR. The edger, anticipated for install in Q2 2019, will include USNR’s BioVision grading module, which combines colour vision technology with high-density geometric scanning to detect biological and geometric defects. “Our challenge is to absolutely bang out recovery every which way we can. Fibre becomes more precious as we go along, both in terms of supply as well as the integrity of the wood. We are driving for recovery in our product,” Epp says. Epp says they went with the BioVision after thorough research from Tolko’s optimization “guru” Derek Daudrich. “He felt it was the best platform to advance our project,” he says. Aaron Davis, principal of MD Engineering based in Grande Cache, Alta., is also involved in the upgrades and earns high praise from Epp. In November, the mill took two weeks down to conduct a major upgrade on the overhead end dogger, including replacing the charger system and adding new controls. Tolko Armstrong underwent a complete planer overhaul in 2015. Mill Tech supplied the trim saws, sorter, stacker and end press. In addition to improving lumber values and recovery, a large portion of the investment is going into safety measures for the sawmill. All new machinery will have direct drives, eliminating the current belt drives that pose safety hazards from moving parts. The new edger will have a safety programmable logic controller (PLC), which automatically turns off the machine when a barrier is broken. Other improvements include better lighting, larger walkways, and better dust collection systems. Peter Foodikoff, Tolko Armstrong’s sawmill supervisor, monitors and manages the pass card system at Armstrong. The system allows employees to identify the hazards associated with the job they are performing. The pass card system also applies to contractors working on the mill upgrades. “As we walk around you’ll see construction pass cards that are being filled out by the contractors. It forces contractors to analyse all the risks and how they are going to handle those risks throughout the day. It’s to make them think and work out a plan. It’s nice to see that,” Foodikoff says. One need only step next door to the planer mill for testimony to the effectiveness of Tolko Armstrong’s project team. Completed in 2015, the planer overhaul resulted in an impressive building to tour. From the raised platform of the infeed deck where a Newnes tilt hoist ushers in dried lumber, you can view the entire line of fresh, Tolko blue steel. 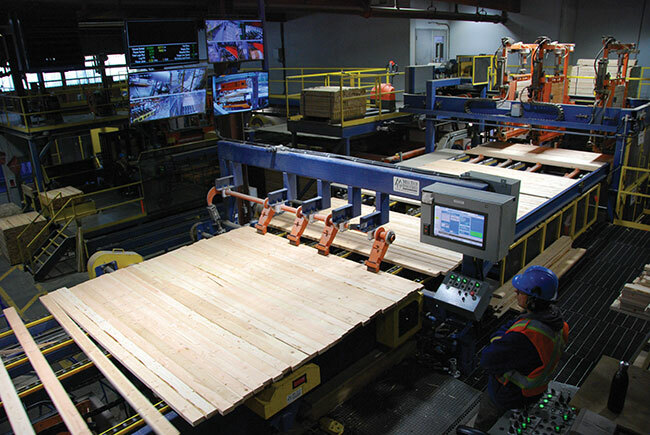 Lumber moves seamlessly through the fully automated line, complete with a 365-degree carousel and automated moving decks. The process begins with a Gilbert planer which pumps out finished lumber at impressive speeds. Boards are then graded by a USNR lineal high grader before heading to a Carbotech Accu-Gate Position System that gently pulls boards into position for the Mill Tech trim saws. A High Precision Length Gauge from SiCam, which includes a fence verification system and length gauge, determines if boards meet the specified customer length. Mill Tech also supplied the sorter, stacker and end press, while the strapping bander is from Samuel. The final stages of the planer are akin to an auto-manufacturing assembly line. A robotic end spray booth from FANUC Robotics is a treat to watch as it emerges from its tucked standby position, rotates to meet the edges of the load, and neatly sprays a thin layer of blue paint. A fully robotic wrapper with multiple arms for twisting, cutting and stapling, supplied by Quebec manufacturer DO2, completes the line. With so much happening at Tolko Armstrong, it’s easy to see why the team is excited about the future. “These changes are great for the mill and for everyone working here,” Epp says. “They’ll help us make the most of our fibre resources and deliver great products. It’s been a great experience working on the project and I know everyone is looking forward to seeing the results of our efforts. “It’s really about taking advantage of technology to provide ourselves with a long-term future,” he says.